When Anna Astvatsaturian Turcotte learned she could be the reason residents in two villages in Armenia receive eye care, she got creative. 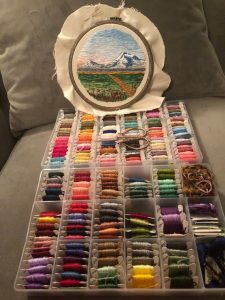 The Armenian-American author, lecturer and activist took out her needlepoint, spools of colorful thread, blank canvas and got to stitching. 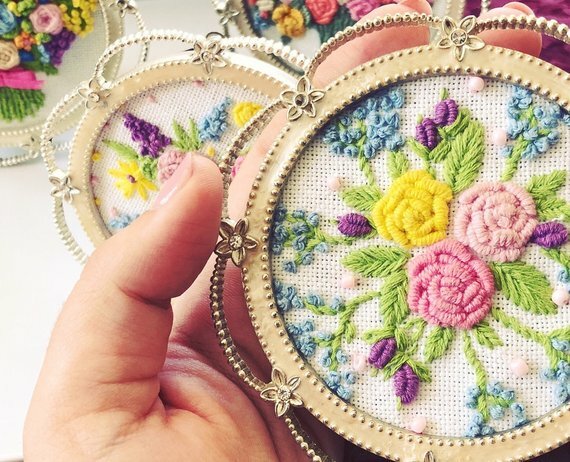 With needlework her mother and grandmother taught her, Anna was able to create unique pieces of breathtaking embroidery — some featuring bouquets of beautifully colored flowers and others showcasing the majestic Mount Ararat — and sell them to family, friends and a network of online enthusiasts on Etsy. In two months’ time, and with orders and donations coming from Maine, Minnesota, North Dakoda, New Jersey, California and even Germany, Anna was able to raise the $1,400 needed to adopt two villages in Armenia that she cares deeply about: Khndzoresk and Karashen. These remote villages, both located in Armenia’s southernmost province of Syunik, are where Anna’s grandfather and grandmother were born. And with Anna’s fundraising efforts, residents of these two regions will now have the opportunity to receive eye screenings, and treatment if needed, at no cost. “From my experience with the Armenian EyeCare Project, the results will be phenomenal,” Anna said, mentioning our readiness to help in 2017, when Anna informed the AECP of Armenian refugees from Baku, Azerbaijan living below the poverty line in Yerevan and who likely needed medical care. 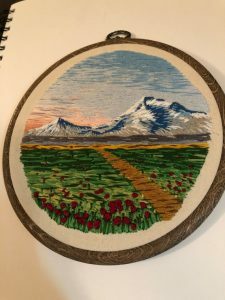 A former refugee herself — fleeing Baku with her family in 1989 due to ethnic cleansing and seeking solace in Armenia before eventually moving to the U.S. — Anna was all too familiar with the hardships of this community and yearned to help. Shortly after hearing about the people in need, the AECP organized eye screenings for residents of the Yerevan dormitory, distributed 150 prescription eyeglasses and performed eight cataract surgeries for those who needed it. With Anna’s adoption of Khndzoresk and Karashen, residents of these two villages — a total population of roughly 2,500 Armenians — will have the chance to get their eyes screened at the AECP’s nearest eye center – the AECP Kapan Regional Eye Clinic in Kapan, Syunik — this May. Those who need treatment, such as prescription glasses or eye surgery, will receive advanced care — again, at no cost. “Imagine what this can do for the people who will regain vision and be able to care for their families and lands in Syunik!” Anna says. 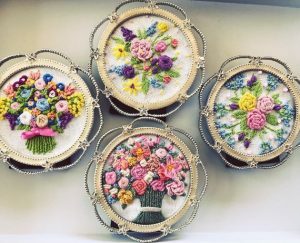 Anna thanks the people who participated in her peer-to-peer fundraising project, buying her embroideries or donating directly to the cause. 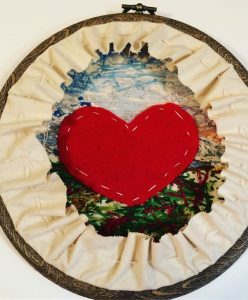 “There is so much we can do with simply love (for needlework) in our hearts,” said Anna. We, too, are thankful — to Anna who started this initiative and to the network of people who contributed to her project. It takes a village to help others in need and as Margaret Mead said, “Never doubt that a small group of thoughtful, committed citizens can change the world; indeed, it’s the only thing that ever has.” We look forward to helping the residents in these two villages in Armenia in May and sharing the process with all of you along the way. Thank you to everyone who has made this possible! For those interested in our Adopt-a-Village program, you may see all the villages in Armenia currently up for adoption here. Adoptions cover eye screenings and advanced treatment if needed for residents of the village. You can adopt a village yourself or join with a group of family and friends to collectively raise funds like Anna did. Either way, you will fund eye care for an entire community in need and make a major impact on the lives of many Armenians.